Stella Nickell's small-time world was one of big-time dreams. In 1986, her biggest one came true when her husband died during a seizure, making her the beneficiary of a $175,000-plus insurance payoff - until authorities discovered that Bruce Nickell's headache capsules had been laced with cyanide. In an attempt to cover her tracks, Stella did the unconscionable. What would turn a gregarious barfly like Stella into a cold-hearted killer overnight? Why would Cynthia, a mirror image of her mother, turn on her own flesh and blood? Did Cynthia reveal everything she knew about the crimes? The stunning answers would unfold in a case that sparked a national uproar, dug deep into a troubled family history, and exposed an American mother for the pretty poison she was. The gift that Gregg Olsen has of making real life sound like a well-done fiction novel is downright uncanny. If you are a True Crime buff, you won't want to miss this. Kevin Pierce is, as always, a top-notch narrator. True crime readers will not be disappointed. 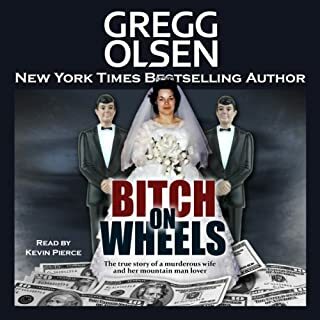 Anyone wanting a quick overview of the Stella Nickell story may not be happy with all the detail which Olsen has meticulously tracked down and recounted, but if you want all the ins and outs of the plot and the characters, this book has it all. I wasn't counting, but this family must be in the race for the highest number of house moves and taking up temporary make-shift accommodation with friends or family, the most partner swaps, the most one night stands, the amount of alcohol consumed, and general bad parenting. On the other hand, they were either in work or looking for work, family (except mothers and daughters) were close-knit and stood by each other through thick and thin, and there was always a friend they could turn to in a crisis. Fascinating family, fascinating plot, intriguing outcome. 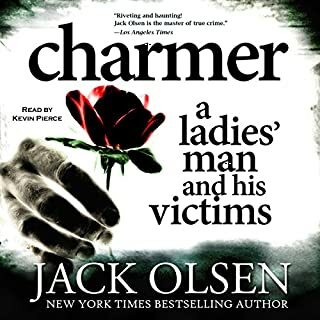 Olsen's research is painstaking and he writes well, although the interweaving of the stories of the two victims' families was a bit confusing at first. Also I felt a bit of the story was missing in my version because it went straight from the jury room deliberations to after the verdict had been handed down which left me baffled about when the verdict had been reached and even more baffled about the phone call to a juror and possible re-trail which were being mentioned. I went back and listened to that section again to make sure it wasn't just me, but it still seemed that part of the book just wasn't there. It is very competently read by Kevin Pierce - a simple straight-forward emotion-free narration - just right for this type of book. Great story kind of long on the details. If you could sum up Bitter Almonds in three words, what would they be? I like details and this book has a lot of details. You definitely don't feel deprived of information after listening to this book. Some reviews state that it was too long, I like all the added information it gives. Kevin Pierce is my favorite narrator and his performances are always number one as far as I am concerned. A generally well done true crime thriller. Not a lot of suspense but for those interested in police investigatory procedures it doesn't disappoint. I found this book fascinating in the sense that a car wreck can be fascinating. We go through life not realizing there is a whole other culture out there. I was hoping for resolution and closure - but after doing a bit of research into the real case behind the book I now understand why none was possible. Okay, if you want a true crime book dripping in blood and bodily fluids, this is not going to be for you--and you might find something deeper than that "boring." But if you are looking for a book that delves into a crime from all angles: forensics, psychology, methodology--then this is going to be more up your dark alley. 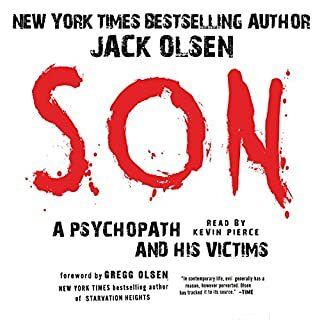 Inspired by his mentor Jack Olsen (no relation), Gregg Olsen has written a deep and thoughtful analysis of a very interesting--and curiously complicated--set of murders. A reader truly interested in the forensics, psychology and police work involved in solving a crime will enjoy every minute of this fine book. Gore seekers stay at home. Did she do it - or not? How crazy was accuser? Riveting account of a family united by their profound dysfunctions. How did a daughter find her way to breaking the bonds of her immediate and extended family, and turning on her mother? The author spends the first half of the book building a hard case condemning Stella Nickells - and yet the second half of the book, the trial, introduced significant questions about her guilt. It is a circumstantial case with sparse physical evidence (if any), built on interpretations of remarks and actions. Remarks and actions that are not so uncommon among the general public and that resonated with my own life (and I haven't tried to kill anyone). The one piece of real evidence that might not be explained away is not a physical item, but a verbal account of purchasing tablets, that could just as easily be a mistake or an error. The case hinged on the testimony of Stella's daughter, and there was no doubt whatsoever that she was an unstable, emotionally damaged personality, as the author vividly portrays. Even the daughter did not provide a confession from her mother, or eyewitness testimony to what it was claimed her mother did. Rather, the prosecutor built a case out of surmise, conjecture and speculation, with almost no hard factual evidence to back it up, and most of the so-called evidence coming solely from the stories told by the profoundly troubled daughter. Based solely on this book (which is all I know about the case), had I been on the jury, I would have had a very reasonable doubt of Stella Nickell's guilt. There were many pointers to possible guilt, but just as many problems with the prosecutor's story, from plausible explanations to outright holes in the account. The book's detailed account of the investigation, the evidence and the trial had me wondering, although it did not ask this question. Could this be a case where a quirky, economically-disadvantaged defendant, with a few low-level trouble spots in her long-ago background, was targeted by the forces of the law as 'easiest to convict'? Was she found guilty of not fitting the stereotype of a conventional wife and mother? The author seems convinced of Stella's guilt, but is nonetheless forthright about the speculative nature of much of the case against her. 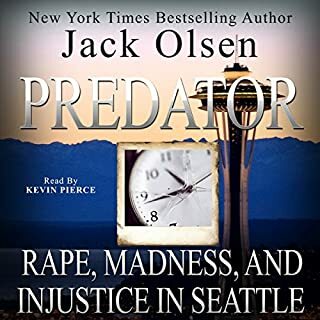 This was a true crime book that is not the usual story of an implosion of a personal relationship, with abuse, confrontation, manipulation and struggle between the victim and the perpetrator. No one charged the victim husband with being a bad guy, just being a poor money manager, and not the party animal his wife apparently wished for in a husband. And the victim stranger had no relationship to the alleged perpetrator at all. The unfortunate lady was just a random victim of product tampering. Her husband's strange actions after her death, including his hasty re-marriage, were explained away by both law enforcement and the author. So the usual villain-victim trope is not the story that is told in Bitter Almonds. It is instead a tale of a more ordinary cycle of miserable parenting and unstable behavior, echoing down through generations of a dysfunctional family. The final outcome, a 30 year prison sentence for the principal character, is vividly portrayed as the result of a perfect storm of emotional damage coalesced in the daughter of the alleged perpetrator. Fascinating story, best enjoyed when the reader / listener can attentively focus on the details and form their own conclusions. I loved it. I love Kevin Pierce. He's my favorite narrator..... 😊 The story is absolutely unbelievable, yet 100, percent true. It had to be a great amount of work and that's putting it mildly. 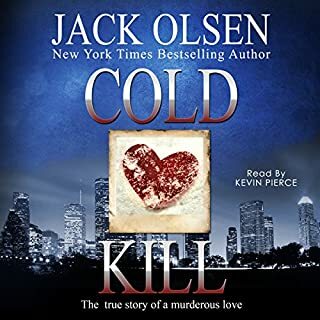 Kevin Pierce, also was a wonderful narrater through out these twists and turns in this Audiobook. Interesting story, characters and excellent narration.... but about 10 hours too long. A lot of hashing and re-hashing of the same story. This book could probably have been completely told in half the time. Long winded and kinda ran off in irrelevant tangents at times but good over all apart from the authors obsession of informing us how 'pretty' characters were....how 'enviably slender' her waist was and beautiful her blonde hair was....STOP IT ! !....you just sound creepy! Just give us the facts and WE will decide if we find this attractive or not. A Page Turner from The Start! Not Holding Back, or Pulling It's Punches as it explains The Internal Strength and Loyalty, often, found within Families routed along The Lower Levels of Society, even, to A Fault on Many Occasions. Darkness is Never Far from The Surface Here as Characters and Plot Play Out from Gripping Chapter to Gripping Chapter! 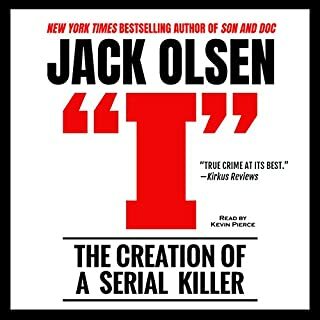 Olson is Indeed A Master of True Crime!! I Recommend This Book to All who are Fascinated by The Human Condition for Power, Influence, and Ego. A drawn out story with a lot of pointles detail. 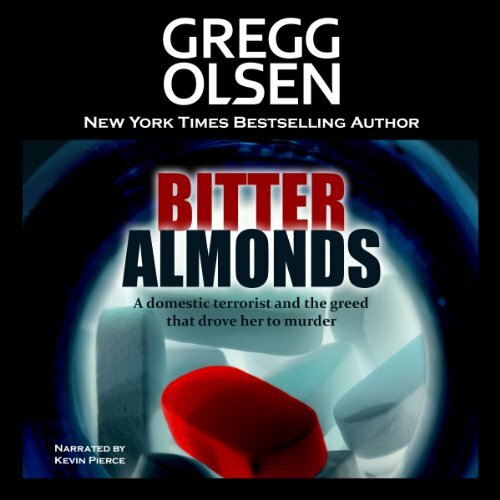 What did you like most about Bitter Almonds? This book is simply about a woman killing people using cyanide, so was not the book I thought it was.A very long drawn out story with a lot of pointless detail.It could have been summed up in less than a third of the 20 hours with writer took.